The Abu Dhabi Fund for Development (ADFD) today formalized a Memorandum of Understanding (MoU) with the Government of the Comoros, which stipulates that the ADFD will offer AED 184 million (US$50 million) to fund the Comorian government's various development programs and projects. Comoros President Azali Assoumani attended the signing of the MoU, which was signed by Mohammed Saif Al Suwaidi, Director-General of the ADFD and H.E. Mr. Mohamed El Amine Souef, Comoros Minister of Foreign Affairs, International Cooperation and the Francophonie, in charge of Comorians abroad. Government officials and senior representatives of the two entities also attended the signing ceremony. 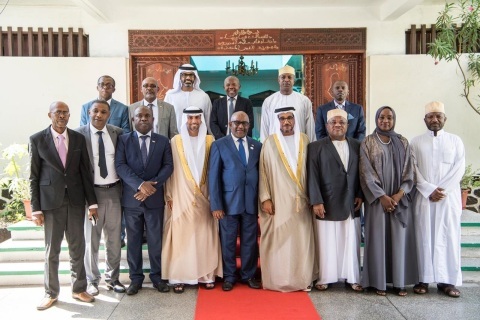 The signing ceremony took place on the sidelines of the UAE delegation visit to Comoros’ Capital city Moroni, to discuss ways to promote bilateral cooperation between the two countries, in all areas related to economic, trade, investment and development. Mohammed Saif Al Suwaidi, Director-General of the ADFD, said that the Fund’s top priority is to provide development funding to allow Comoros to achieve sustainable growth and has already disbursed significant grants to help the Comorian government to overcome economic and developmental challenges in key sectors such as health, education, transport, water and electricity. H.E. Mr. Mohamed El Amine Souef expressed his appreciation for the UAE’s ongoing support for the Comoros, stressing that the grant will enable the government to further drive economic and social growth in the country. The Abu Dhabi Fund for Development (ADFD) activities in the Comoros date back to 1979, where the Fund has financed several development projects to the tune of about Dh253 million in strategic sectors.